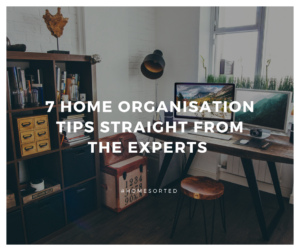 7 Home Organisation Tips Straight from the Experts - Home Sorted! Not everyone has the means to let a professional organiser loose on their home! For some of us, it’s DIY all the way. For this reason, we’ve put together our top expert tips. Sit back, have a read, and start planning your next home organisation session. For most people, storage space is very limited! We just can’t seem to get enough. Make the most of what you have by using vertical storage. This is particularly handy in the home garage where you can use hooks to hang household and garden tools. Just think of all the floor space you’ll gain back. A great way to maximise space is to seek out furniture with built-in storage solutions. This can include coffee tables with additional shelves, ottomans, and bedside tables with drawers for your odds and ends. This should be a no-brainer, but it’s something lots of us struggle with! Try and get into the habit of putting items away as soon as you’re done with them. This will prevent clutter from forming, keeping your home nice and sorted. You can never have too many labels. They’re particularly great for the kitchen and home office. We also like to use them in kid’s bedrooms as a handy reminder where things go. One of the most disorganised areas of the home is the wardrobe. We recommend decluttering yours at the start of each season. You can also use this as a chance to store clothing items you won’t need for a while, such as winter coats in summer. Another effective way of reducing clutter is by going paperless. Consider getting your bills via email and get into the habit of tossing your junk mail into the recycling bin as soon as you receive it. Unless you’re waiting for a particular catalogue, most of it will simply become clutter! 7. Make your bed every morning! You can’t deny that coming home after a long day at work to a freshly made bed is a great feeling. It also makes your bedroom look organised and tidy! Are you ready to get home sorted? We sure hope so!